So also Christ glorified not Himself to be made a High Priest, but He that said unto Him: "Thou art My Son, today have I begotten Thee." And the text is Hebrews 5:9: "And being made perfect, He became the author of eternal salvation unto all them that obey Him." When the awakened sinner faces inevitable death and judgment – and, by and by, all of us come to that stark reality: "It is appointed unto men once to die, and after that the judgment" [Hebrews 9:27]. When a lost, condemned sinner comes to that stark, dark, tragic reality, he cries: "What shall I do, and how shall I be saved?" And, first of all, he inevitably looks to himself. For one thing, he will reform: "I will cease this, and I will add this." And by self-reformation, he seeks to prepare himself to meet God. Then, sometimes, he will look to his feelings and he will try to have the right kind of feelings, and he will defend himself in the feelings that he has as he faces the judgment of God. Then, sometimes, he will turn to rites and rituals and ceremonies and by these institutions and ordinances – the observance of this, and the paying attention to that, and the bowing before the other, and following all of those prescribed ordinances – he will think by those rituals and ceremonies to prepare himself to meet God. But a man had as live, look in the ribs of death to find life. He had as well dig in the dreary vaults of outer darkness to find light as to turn to himself and find in himself this way and ableness to stand in the judgment day of Almighty God. It would be as easy for a man to save himself and to prepare himself to stand before God in himself – it would be as easy for him to look to himself for salvation as it would be for him to raise himself from the dead. One would be just as easy as the other. When we die, our frames are helpless, and when we die, our souls without a Savior are lost [Matthew 7:21-23]. God hath prepared a way for a lost, condemned, dying, judgment-bound sinner to be saved, and God points to His Son: Turn and look [John 3:14-15]. He was made perfect for that purpose [Hebrews 5:9]. He has perfect fitness as the Savior. In no sense does the word "perfect" in the Bible mean "without sin, without blemish, without spot." The word means "He is perfectly fitted." He has been brought to that place. He has achieved that place that God hath chosen for Him, hath appointed Him, hath ordained Him. And God says in this text that Jesus has perfect fitness for our being a Savior; and to those who obey Him, He is the author of an eternal salvation [Hebrews 5:9]. So we’re not to look to ourselves. We’re to look to Him, andwe’re not to find in frames and in feelings and in reformations and in rituals and in ceremonies and in ordinances and in organizations and in joinings up – we’re not to find in these things our ableness to stand in the judgment day of Almighty God. But we are to look to Him whom God hath prepared to be our perfect Savior. Now, this passage that you read is a presentation of the perfect fitness of our Lord to be our Savior. There are two ways that the passage speaks of in which Jesus, being made perfect – in which Jesus was made to be our perfect Savior. The first way is God-ward and the second way is man-ward. He speaks of three things here in the passage by which the perfect fitness of Jesus is exhibited to us as our Savior God-ward, and the first is this. Our Savior – to represent us, to stand for us, to be all-sufficient and adequate for us – our Savior must be a man who is appointed and ordained of God [Hebrews 5:4]. I could not be a savior nor could any other man be a savior for the simple reason that God hath not chosen us. God hath not appointed us. God hath not ordained us. The Savior, who must stand as our representative before the high courts and the judgment bar of God [Hebrews 5:1], must be one who is appointed of God, ordained of God, chosen of God. In the passage that you read: "And no man taketh this honor unto himself, but he that is called," [Hebrews 5:4] – that is chosen, that is ordained of God. "So also Christ glorified not Himself to be made an high priest, but He was chosen of God" [Hebrews 5:5]. He was ordained of heaven. The first qualification of our representative who is to plead our cause in the great judgment day of the Almighty is that he is to be ordained. He is to be chosen. He is to be appointed by God. And that ordained representative who is to be our advocate, our pleader, our representative, and our Savior is Jesus Christ, God’s Son [1 John 2:1]. The second qualification that He must have God-ward is that He must be acceptable unto God [Hebrews 5:3]. This representative, this Savior of ours, in His perfect fitness to be our Savior, being made perfect [Hebrews 5:9] – this representative and Savior of ours must be acceptable unto God. By that, I think the Lord especially means there is no other order of beings that God has created who could stand in our stead and in our place. An angel could not represent us. A cherub, a seraph, could not stand in our place. The Law has to do with a man, and it is the obedience of man that God requires [Romans 2:11-16; James 2:10]. There must be a Second Adam to head a new and a regenerated and a spiritual race, and an angel could not do that. An angel would not be acceptable unto God. But the new Adam, the new head of the new race, is found in the perfect obedience of Jesus, our Savior [1 Corinthians 15:45]. And for that purpose, He came into the world that He might fulfill the Law [Matthew 5:17], that He might be obedient unto God [John 6:38]. And from the day of His childhood when He said: "Wist ye not I must be about My Father’s business?" [Luke 2:] until the day that He died on the cross and cried, "It is finished" [John 19:30], He was a perfectly, obedient servant of God [John 17:4; 1 Peter 2:2]. He was acceptable unto God. The third qualification of our representative and our advocate must be – third, He must offer a sacrifice that is acceptable unto God: "Every high priest taken from among men . . . or in things pertaining to God, that He may offer sacrifice for sin" [Hebrews 5:1]. The sacrifice that He makes must be acceptable unto God, and the sacrifice must be efficacious for the atonement of our sins, the washing away of our guilt. The lamb that was brought had to be without spot and blemish [Exodus 12:5], and the high priest carefully examined it before it was offered on the altar. So the sacrifice that atones for our iniquities must be acceptable unto God, and God carefully examines it. And when a man comes before the Almighty and he offers the propitiation and the expiation of his own works, of his own goodness, of his own righteousness, God says they are as dirty as filthy rags [Isaiah 64:6]. When the Lord examines our souls and He examines our hearts and He examines our lives, He finds blemish and spot and stain and darkness and guilt [Romans 3:10-18], and there is no sacrifice that we can bring unto God as an expiation of our sins that is acceptable unto Him [Romans 6:23]. But our Savior has offered a perfect sacrifice, and He is, in that, perfectly fitted to be our Savior [Hebrews 5:9; 1 Peter 1:18-19]. God examines the heart, the soul, the life, the mind, the deeds, the days of our Lord, and they are perfectly acceptable unto Him: "And the blood and expiation, when I see it, I will pass over you" [from Exodus 12:13] is the blood of expiation that washes us from all of our sins [1 John 1:7]. God does not demand payment twice. He does not exact the penalty twice, and when God accepts the sacrifice of the Son of God in our stead and for our sins, we are no longer under the wrath and the judgment and the damnation of an everlasting punishment [Romans 5:1; 1 Thessalonians 1:10]. God accepts the sacrifice of Jesus in our stead [Colossians 2:13-14]. When you read in these papers of the heinous and terrible crime, and a man is brought and accused at the bar of justice, and he is tried and he is convicted and he is executed, the case is closed. It is never opened again. I can so well remember in the days of kidnapping of the Lindbergh baby [Charles A. Lindbergh, Jr., 1932] when they brought that man whom the state accused, a man named Hauptmann [Bruno Richard Hauptmann, 1899-1936]. And when he was tried and when he was executed, all of the things that went before – the accusations, the testimonies – all of those things that accused him and condemned him, they filled the headlines. They filled the papers. It was the talk of every table. It was the conversation of every group. I have never seen in my life any trial that ever reached the pitch of emotional intensity that the trial of the kidnapper of the Lindbergh baby brought to pass in the American public. And the day that man who was convicted was executed, from that day until this, outside of a historical reference, I have never heard it mentioned again. There is no such thing in any court of justice or any court of law where a penalty is exacted twice. When it is paid, the case is closed and closed forever. So it is in the judgment bar of Almighty God. When the penalty is paid, when the sentence is executed, when the blood and the life is poured out, God says: "It is enough," and He does not exact payment twice [Hebrews 10:14]. Either Christ dies or I die [Romans 6:23]. He dies or you die. Christ died [Romans 5:8]. There is no need for the exacting of another penalty. The case is closed [Romans 6:10]. 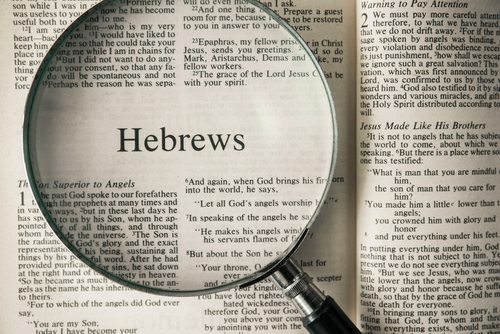 It is over [Hebrews 9:28]. It is done for [1 Peter 3:18]. It is finished [John 19:30]. Expiation and atonement is complete [Colossians 2:13-14]. It is just for us to accept the gift of life and to live [John 1:12; Ephesians 2:8-9]. He is the perfect Savior God-ward. He’s appointed of God [Hebrews 5:5-6]. He is acceptable unto God, and the sacrifice that He offers is efficacious. God says: "When I see the blood, I will pass over you" [Exodus 12:13]. "In His own body, He bare our sins on the tree" [1 Peter 2:24]. "This Man, having once made a sacrifice for sins, sat down upon the right hand of Majesty on High" [Hebrews 10:12]. There is no more sacrifice. It is complete. It is over. It is finished. God is propitiated in His Son [1 John 2:2]. The great transaction is made [2 Corinthians 5:21]. He is the perfect Savior [Hebrews 5:9]. In His perfect fitness to be our Savior, He is our perfect Savior God-ward. He is our perfect Savior man-ward. The reading of the text just before: "In the days of His flesh, praying, supplicating and strong crying and tears . . . though He were a Son, yet learned He obedience by the things which He suffered" [from Hebrews 5:7-8]. And, now, being our perfect Savior, He’s our perfect Savior man-ward. Because He came down into this dark and cursed world that He might live our life and weep our tears and bear our burdens and taste death for every man [Hebrews 2:9], He’s our perfect Savior man-ward. This is the great recurring theme of the author of the Hebrews: that God became man that He might lift man up to God; that He can be moved with the feeling of our infirmities [Hebrews 4:15]; that He was tried in all points as we are, though without sin, that we might come boldly to the throne of grace and find grace to help in time of need [Hebrews 4:16]. He is our perfect Savior man-ward. In the passage that you just read, He must be one taken from among men that he might have compassion on the unknowing and on them that are out of the way [Hebrews 5:1-2]. The great, great diatribe against our Lord by those who sought His destruction was this: "That fellow receives sinners and eats with them" [Luke 15:2]. Out of all of the things they could say, that was the thing that they avowed: "He receives sinners. He sympathizes with men. He mingles with men. When their tears fall, His fall. When they’re burdened, He’s burdened." "Himself bare our sicknesses and carried our infirmities" [Matthew 8:17]. He left the throne for the cross for that purpose [Philippians 2:5-8; Hebrews 2:9]. He left the adoration of angels for the mockery of menials [Mark 5:40] and a blaspheming crowd [Matthew 12:22-24, 27:22-24]. For that purpose, He left yonder glorious regions of light to come down with us in the valley of the shadow of death [Psalm 23:4], with us who sit in darkness [Matthew 4:16-17]. He came down for that purpose: that He might be to us man-ward, human-ward, infirmity-ward our great and perfect Savior [1 Timothy 1:15; Hebrews 5:9]. And the text says "He became the author of eternal salvation" [Hebrews 5:9]. I like that word, don’t you? "He became the author of eternal salvation" [Hebrews 5:9]. And by that, this author refers – and we shall in many instances come back to it as he progresses in the writing of this book – by that, he refers to the fact that in Christ we have one atonement for sin, and there is one gift of salvation, and it is all-adequate and all-sufficient and never needs to be repeated again. When the Hebrew came to the high priest, he brought a sacrifice. He brought a ram [Leviticus 6:6-7]. He brought a lamb [Leviticus 5:5-6]. If he was very poor, he brought a turtledove or a pigeon [Leviticus 5:7, 11]. He had sin, and he brought a sacrifice for atonement, for expiation, for the washing away of the guilt of his soul. And there, before his eyes, the priest slew the lamb or the bullock or the turtledove or the pigeon, and his blood was poured out and it was offered up unto God [Leviticus 5:8-10]. And the Hebrew went back home with his conscience cleansed and his heart free. Expiation had been made for his sin. Then he was back again with another lamb or with another bullock or with another ram or with another turtledove or with another pigeon. He had sinned again. He had fallen into transgression and shortcoming again. And, here, that same Hebrew is back again with another sacrifice – another lamb, another turtledove, or another pigeon. And all of his life did he live in that constant remembrance of sin – coming back with the sacrifice, coming back with blood and expiation, coming back with atonement, for he had sinned. And sin demanded a sacrifice again and again and again [Hebrews 10:1-4]. In the most holy of all the high days of Israel, the high Day of Atonement, the priest gathered all of the nation at the door of the congregation of the Lord [Leviticus 16:29-30, 34], and there the animal of sacrifice was presented before Jehovah. The hands of the high priest were clasped over the head of the animal in confession and in prayer, and the animal was slain and its blood carried into the Holy of Holies and there presented unto God as an expiation for the sins of the people [Leviticus 16:11-20]. Then then he came out and the scapegoat was sent away [Leviticus 16:21]: a picture, a type, of the bearing away of the sins of the people [Leviticus 16:22]. What a holy ordinance and what a heavenly, sober, sanctifying ritual. And when you look upon it, how meaningful, how significant. And after it was over and the scapegoat sent away, after the blood had been poured out, after the priest had entered into the Holy of Holies to bear it up and to present it before God – the nation went home with its conscience cleansed and its sin expiated. But at that same time – at the same period, at the same hour, on the same day – the following year, the same people were back again [Leviticus 16:29-30]. And there was the same high priest with a sacrificial animal, with his hands clasped in confession over his head, the animal slain, the blood poured out again, the scapegoat sent out into the wilderness again and the people sent back home again. And every year, there was the same remembrance of sin [Hebrews 10:1-3] for the blood of bulls and of goats could never suffice for the washing away of the guilt of the soul [Hebrews 10:4]. This author says: "Being made perfect – our perfect Savior – He became the author of an eternal salvation" [Hebrews 5:9]. It’s once and for all [Hebrews 10:14]. He doesn’t die twice [1 Peter 3:18]. One time [Hebrews 9:28]. And the pouring out of His blood of atonement, expiation is all-sufficient and all-adequate [Romans 3:21-26]. There is no more remembrance of sins. Sins of the past, sins of the present, sins of the future have all been washed away in the blood of the Lamb [Colossians 2:13-14] – one sacrifice [Romans 6:10]. And to those who turn in faith to Him, He offers an eternal salvation [Ephesians 2:8-9; Hebrews 5:9]. I like, I say, that word "eternal." Don’t you? "I give unto them eternal life" [Hebrews 10:28]. If it’s temporary, it’s not eternal. If you can lose it, it’snot eternal. If it has to be done again and again, it’s not eternal. If it has to be repeated every year, it is not eternal. Nor height or depth,nor any other creation, shall be able to separate us from the love God which is in Christ Jesus our Lord. He offers an eternal salvation. It lasts forever and forever and forever. I have found that true in experience. If a man has ever been saved, if he has ever been regenerated, if he has ever come under the blood of the Cross, he will never ultimately fall away from it, forget it. He will never ultimately fall into those ways of sin and blasphemy that mean perdition and damnation. He can’t. He won’t. He may drift. He may stumble. He may turn, but he’ll always come back – always. I do not know of a better way to present that to you than in a revival meeting that I held one time. And the people said, "Out here on the edge of town is a man who, in the days of his youth, had a godly father and a godly mother. And he was a godly son – converted and saved and baptized and honored the Lord with his life. And, now, he’s out there running a joint, running a den, running a dive, running a honky tonk." And they said to me, "Out of the love of the memory of his godly parents and out of love of the memory of his youth, we thoughtwhile you were here maybe you could see him." Well, I went out there on the edge of the little city, and there was one of those vile-smelling, sorry, no-count dives. Walk in, there’s a little dance floor and a juke box over here on this side where you drink beer. And the thing smells. It’s an affront to everything that is decent and good and nice. And I asked where the owner was, and one of those cheap girls said, "Back there." So I went through a door and into the back, and there at a table sat a man. I introduced myself – the preacher in the church holding the revival – and asked him if he were the owner of the place and if his name were thus and so. I asked if I might sit down by his side and talk to him. So I sat down by his side, and I began to talk to him. Well, you know this before I even say it. I began to talk to him about his mother. You know, it’s a remarkable thing. Fellow can be just as hard as nails – just as blasphemous as he can be – but if he had a godly mother and a godly home, just ask him about his mother. His mind will go back to another day and another time and another life. It wasn’t long until he was saying to me, "I am so miserable and I’m so wretched, I could die." He said, "I have thought about it; Ihave considered it – this place and this life and these people." Well, I said to him, "Why don’t you stand up? Why don’t you go down there to the church? Why don’t you go down that aisle? Why don’t you come back to God? Why don’t you?" That night, when I got through preaching, down the aisle that fellow came. He stood before the congregation and said, "You know me and what I been doing and the life I been living. But," he said, "Tonight, I’m coming back to God. I have been so wretched and so miserable, andI’mselling that thing and I’mgetting out of that business. I don’t know what I’ll do, but God helping me, from now on, I’m coming back to the Lord and back to His church." And he did. He sold that dump. He got him another job. He was that same, righteous, devout, holy, godly Christian again. You try it. If you have ever been really saved, if you have ever been honestly, really, genuinely regenerated, you try it. Go out there in the world. Live with dirty and filthy people. Give your life to every off-colored party and every unholy and blasphemous thing that a sinner can share and enjoy. And down underneath, there’ll be something in you crying out against it. There’ll be a voice you can’t still! There’llbe a love you can’t forget. There’llbe a dedication you can’t drown. It is the seed of God that never dies, and you’ll be back. You’ll come back. He is that perfect Savior, and He became the author of an eternal salvation [Hebrews 5:9]. You don’t lose it. You are held in God’s unchanging hand [John 10:28-30]. I must close, but this passage closes with an appeal. You have it translated here in the word "unto all them that obey Him" [Hebrews 5:9]. You would think from that that you kept commandments in order to be saved. The author had nothing like that in his mind. And to translate that "obey" is not quite what it is. That Greek word there is hupakouō. The word "to hear" is akouō; "acoustic," akoustikon; "to hear" – akouō. Hupakouō means "to harken to, to listen to." And He’s our perfect Savior, and "He became the author of eternal salvation unto all of them who will harken to Him, who will listen to Him" [Hebrews 5:9]. There is a voice to hear. That’s why he said here, in that previous chapter – the third one – "Today, if you will hear His voice, harden not your hearts" [Hebrews 3:15]. "If you will hear His voice . . . " and he repeats that same thing again in the text [Hebrews 5:9]. He’s our perfect Savior and the author of an eternal salvation unto all them that will hear Him, that will listen to Him, that will harken to Him, and that’s His appeal: "Oh, listen. Hear and hear,but really hear. Listen. Harken to Him." Why a man is lost is because he won’t hear. He won’t harken. He won’t heed. Saul would not listen to Samuel, and he lost his kingdom [1 Samuel 13:13-14, 15:1-26]. Rehoboam would not listen to the sages of his day, and he lost his throne and his house [2 Chronicles 10:1-19]. Listen to Him. Listen to Him. "The author of an eternal salvation unto all them that will harken to Him" [Hebrews 5:9]. Listen to Him. Listen to Him. He speaks. He speaks to you.Listen to Him. Listen to Him. "To all those who hear Him, who harken to Him" [Hebrews 5:9]. Those ten lepers listened to the Savior, and on their way to the priest they were cleansed [Luke 17:11-14]. That blind man to whom the Lord said "go wash in the pool of Siloam" – and he listened to the Lord, and when he washed, he became seeing [John 9:1-7]. Listen to Him. Harken to Him. When Naaman stood before Elisha, the man of God, Elisha said: "Go down to the Jordan and dip seven times and thy flesh will come again unto thee like the flesh of a little child and thou shalt be clean" [2 Kings 5:9-10]. Andwhile he was driving his chariot away furiously, one of his servants standing by his side said, "My father, if the prophet had bid thee do some great and mighty thing, wouldst thou not have done it? How much rather than when he says wash and be clean?" [2 Corinthians 5:13]. Naaman turned his chariot, went down to the Jordan River, dipped himself one time and twice, five times and six, and when he dipped himself the seventh time, his flesh came again like unto the flesh of a little child. And he was clean according to the saying of the man of God [2 Kings 5:14]. Listen, harken, heed it, and you’ll be saved. Oh, oh, while we make this appeal, and while our people sing this song, and while the Holy Spirit of God speaks to your heart, will you listen? Will you obey Him? Will you come? Will you trust Him? Will you be saved? Will you do it now? Tonight? Will you? There is a stairwell, and there; there’s a stairwell, and there. If you’re in this balcony around, would you come? Would you make it tonight? "Here I am, and here I come." On this lower floor, wherever you are, the Spirit of God speaks to you. Out of your place, into the aisle and down here to the front, will you come? Will you make it tonight? "Here I am, preacher. I give you my hand. I give my heart to God." Taking Him as Savior or putting your life with us in the fellowship of the church, will you come now? Will you make it tonight while we stand and while we sing? A. When a lost man faces death and judgment he cries, "What shall I do?" IV. An appeal "unto all who obey Him"
A. Hupakouo – "to harken to, to listen to"